When traveling, one can either go sight-seeing, food-tripping, museum-hopping, opera-watching but for the more adventurous person, scuba diving, skiing and trekking would be the ideal activities. To top the list of the best diving spots in the world is the Cayman Islands. All three islands; Grand Cayman, Cayman Brac and Little Cayman are actually exposed tops of underwater mountains. So the sides are quite steep adding attraction to divers for a bit more adventure. Through the years, diving in Cayman has gained prominence that most most of the resorts and establishments cater to, what else, but diving. Tourism thrive solely on this…oops and the lovely beaches that Cayman is known for. There are now many websites offering package tour holidays when staying at any of the three Cayman islands. 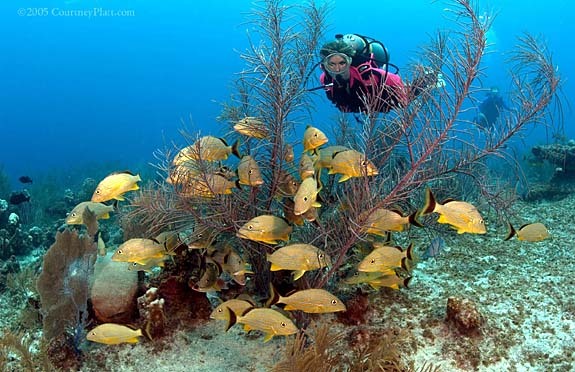 One of such sites ishttp://www.divecayman.ky, which also has a dive planner to satisfy specific diver’s needs. One can choose which Island to dive at, which resort to stay at or if one prefers a villa, a hotel, they have those in the options too. Cayman Islands is truly one of the best spots to dive, take underwater photos too as the best nature has to offer is best captured not only in your memory but in photos too!